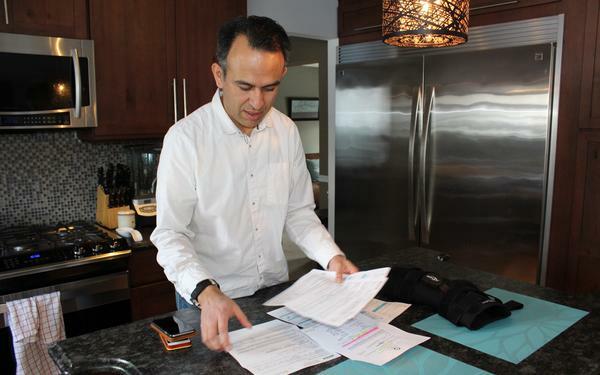 After a sports injury, Esteban Serrano owed $829.41 for a knee brace purchased with insurance through his doctor's office. He says he found the same kind of brace selling for less than $250 online. Last October, Esteban Serrano wrenched his knee badly during his weekly soccer game with friends. Serrano, a software engineer, grew up playing soccer in Quito, Ecuador, and he has kept up the sport since moving to the United States two decades ago. He hobbled off the field and iced his knee. But the pain was so severe that he made an appointment with Rothman Orthopaedic Institute, a network of orthopedists practicing in Greater Philadelphia, New Jersey and New York. The doctor diagnosed a strain of the medial collateral ligament and prescribed over-the-counter pain medication as well as a hinged knee brace, which Serrano used for several weeks until he'd healed. He expected his insurance to cover his treatment. A plan from a previous job had covered him when he needed surgery to fix a broken nose sustained in another soccer game in 2017. Patient: Esteban Serrano, 41, a software engineer and father of two from Phoenixville, Pa., outside Philadelphia. Total bill: $1,197. $210 for the office outpatient visit, $105 for an X-ray and $882 for a hinged knee brace, all billed by the orthopedic practice. His insurer, Aetna, negotiated only $52.59 off the cost of the brace. That left Serrano with a balance of $829.41 because he hadn't met his $3,000 deductible for the year. Service provider: Rothman Orthopaedic Institute in Bryn Mawr, Pa.
Medical service: A doctor examined Serrano's knee and sent him for an X-ray. The doctor said he should use a knee brace for four weeks and recommended a hinged one sold through the practice. What gives: A medial collateral ligament injury is a common knee injury occurring frequently among participants in contact sports. According to the American Academy of Physical Medicine and Rehabilitation, the medial collateral ligament is involved in at least 42 percent of knee ligament injuries. Although most cases are sports related, such injuries can also result from everyday activities like tripping on stairs. Serrano said the brace did ease the discomfort and stabilized his knee as it healed. However, the bill was almost more painful — he owed the orthopedic practice $829.41. "You can find the same brace for less than $250 online," he said. Serrano, a software engineer, grew up playing soccer in Quito, Ecuador. After straining a medial collateral ligament, he got a brace to help it heal. The bill came close to Christmas, when Serrano's 12-year-old daughter wanted her first iPhone. "I told her, 'Sorry, honey, but I already paid a price of an iPhone for the hinged knee brace,' " Serrano joked. Serrano emphasized that he felt lucky to have the money to handle a bill that for many people could equal a month's rent or three months of groceries. 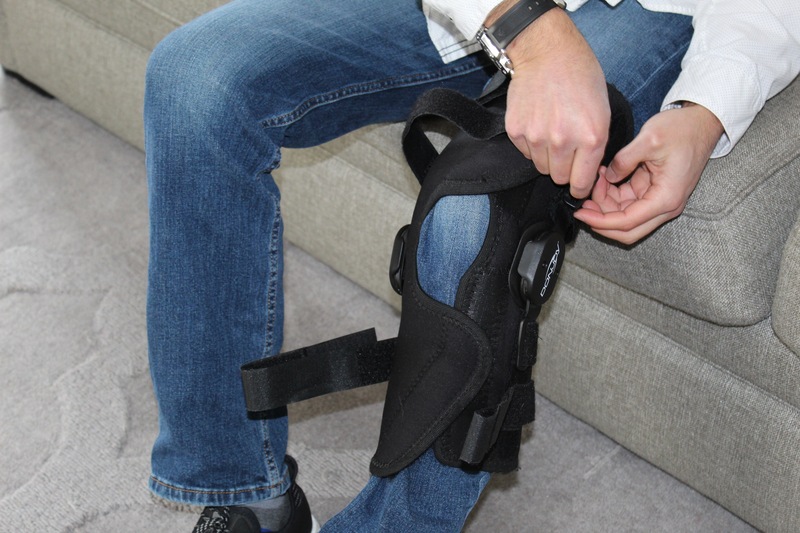 Knee braces fall into a category of products called "durable medical equipment," whose prices can vary widely. Items range from slings and braces to wheelchairs and commodes. They also include glucose meters and breast pumps for new mothers. Doctors and hospitals that dispense such equipment for patients to take home almost always bill for them and add hefty markups that can catch patients unaware. Braces and other products "are often marked up two or three times what the cost is, and unfortunately, that is the standard practice," said Dr. Matthew Matava, an orthopedic surgeon and chief of sports medicine for Washington University Physicians in St. Louis. Rothman Orthopaedic didn't respond to requests for comments. The type of hinged knee brace Serrano bought was a DonJoy Playmaker. DonJoy is one of the nation's largest producers of braces. A customer service representative for the company said it charges a retail price of $242.51 for the model that Serrano got. Serrano paid more than three times that price. In an emailed statement about the case, an Aetna spokesman wrote that "while the cost of a knee brace, or any other health care service, is determined by the negotiated rate between the health care provider and the health plan, the starting point is the charge from the health care provider." It is not even clear that such an elaborate knee brace was needed for Serrano's injury. Dr. Elizabeth Matzkin, chief of women's sports medicine at Brigham and Women's Hospital in Boston and an assistant professor at Harvard Medical School, said that while it is helpful to give patients some kind of knee brace for support after medial collateral ligament injuries, the use of a hinged knee brace does not influence recovery, according to studies. She called hinged braces "luxury products." Simpler, cheaper braces also offer support. Resolution: Serrano recalled that when he received the brace, an employee showed him a form with its estimated cost in writing. He remembered his share was more than $700, but he didn't pay too much attention because he assumed his insurance would cover it. After receiving the bill, he made several phone calls to the doctor's practice to get a copy of the form he'd signed. It stated that the product could be returned within seven days. A month had already passed. Because he had not met his deductible, his $829.41 balance was even more than the estimate. The takeaway: These days, many types of equipment dispensed by doctors' offices or hospitals involve a charge. Don't assume generosity. Ask the doctor to identify precisely what you need and explain why you need it. When a doctor or hospital offers you a piece of equipment to help your healing, decide if you really need it or will use it. Say no if you won't. Ask if you will be billed for it and how much. Many items can be purchased at a fraction of the cost online or from a pharmacy just down the block. Know your insurance plan's copay or coinsurance for medical equipment (often 20 percent). The cost of purchasing the equipment yourself online may well be less than if you purchase through a medical office. NPR produced and edited the interview with Kaiser Health News' Elisabeth Rosenthal for broadcast. Kaiser Health News is a nonprofit news service covering health issues. It is an editorially independent program of the Kaiser Family Foundation that isn't affiliated with Kaiser Permanente. All right. It's time for our bill of the month. This is where we take a close look at medical bills that you send to us. And this month, we've got one that I bet a lot of people will relate to, especially those of you who play sports and have gone through an injury. Elisabeth Rosenthal is editor-in-chief of our reporting partner Kaiser Health News. And she joined us from our studios in New York City to tell us about who we're meeting. ELISABETH ROSENTHAL: This month it's Esteban Serrano. He's a 41-year-old software engineer from the suburbs of Philadelphia. GREENE: OK. And I think we have a little tape of him here describing exactly what happened to him. ESTEBAN SERRANO: Last year around October, I got injured - my knee - playing soccer, or football. Yeah. It was a bad bruise. I got - my MCL got injured. But I went to the doctor to get an opinion to see what the problem was. And after the doctor saw me, did an exam and X-rays, he suggested I wear a brace to help with the healing and give me a little bit of support. GREENE: All right. That doesn't sound that bad - nothing broken, has to wear a brace. I mean, that's the kind of thing a lot of people go through, right? ROSENTHAL: ...Purchased through the doctor's office for $882. ROSENTHAL: And since he hadn't met his deductible, he paid most of that himself. GREENE: Most of the $800. I mean, you say hinged knee brace. Is this some kind of special brace that would be a lot more expensive? ROSENTHAL: Well, yeah. It is kind of a fancy brace. It has a hinge where your knee bends. But, you know, that's not really justified here. First of all, the company that makes it says the retail price is about $242. But it's not really clear why this patient needs a fancy knee brace. I mean, you know, we all know you can go into Target or Costco and buy a knee brace for about $20, and that probably would've done the trick. GREENE: All right. Well, let's listen to a little bit more of his voice here. SERRANO: This is a very simple - you know, your run-of-the-mill injury that anybody can, you know, twist their knee. They can twist their ankle, go to an orthopedist. And if, you know, they happen to give you this kind of a brace, then you're in for an $800 bill. I don't think that there's a reason why anybody should be paying $800 for a $100 or $50 brace. GREENE: All right. So clearly it sounds like he feels like he's been taken for a ride here. So have we learned more about why this happened from, like, the doctor's office? ROSENTHAL: Well, not exactly. The doctor's office didn't return our multiple phone calls. We actually got some info from another orthopedist who said, oh, yeah. You know, doctors' offices routinely up-charge two to three times what their wholesale cost is. And I like to point out for consumers that it's not just knee braces. It's everything that a doctor or a hospital might give you to go home. So crutches, a breast pump, a wheelchair - all of those things are up-charged heavily by these offices. GREENE: So is there anything patients can do about that so they're not being up-charged by their doctors? ROSENTHAL: Well, (laughter) you know, I think we tend to think of visits to the doctor as kind of all-inclusive resorts, but that's not how it works these days. These days, every item is likely to be charged and likely to be charged a lot. So I always tell people, don't take anything you don't feel you need or won't use. And I think you should also ask why you need a fancy version of this rather than the one you could get at your local pharmacy. You could even Google from the doctor's office and see, like, how much would this cost me if I bought it online? So you'll save a ton of money like that. GREENE: Wow. OK. So - I mean, so besides actually finding a corner of the doctor's office to, like, Google for five or 10 minutes and make sure you're not being overcharged, is anyone out there trying to change this practice and put pressure on doctors' offices not to do this? ROSENTHAL: It's kind of unseemly, but this one is not actually illegal. It's kind of like what restaurants do when they sell you cheap wine for $20 a glass, right? But this is one where being a good consumer can really make a difference. It takes advantage of patients who are unaware and vulnerable. But, hey, now that you know this happens, next time a doctor says, hey, your kid's elbow is injured - we'll give you a sling - say, uh-uh, I'm going to go buy one at Rite Aid. GREENE: Just think about the number of people who get these kinds of ankle braces, knee braces, you know, like, the stuff you mentioned. I mean, this is a lot of money that doctors' offices are charging people. ROSENTHAL: ...As Mr. Serrano said, that $800 was unexpected, and it meant he couldn't buy his kid an iPhone for Christmas. So it can make a big difference in people's lives. GREENE: It sure can. All right. Dr. Rosenthal, thanks as always for being here. GREENE: That is Dr. Elizabeth Rosenthal. She's editor-in-chief of Kaiser Health News. And if you have a medical bill that seems kind of inflated or kind of mysterious in some way, something that concerns you, and you want us to have a look at it, just go to our Shots blog at npr.org, and submit it to us online. Maybe we'll talk about it. (SOUNDBITE OF BONOBO'S "ANTENNA") Transcript provided by NPR, Copyright NPR.